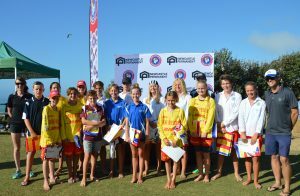 The 2018/19 Newcastle Permanent Junior Lifesavers of the Year were announced at the Newcastle Permanent Junior Branch Championships at Soldiers Beach. The nominees who attended this year are an absolute credit to themselves, their parents and the Surf Clubs who assisted with their preparation. The candidates this year were of a very high calibre and as a Branch, we are very excited and confident in the future of our Surf Lifesavers here on the Central Coast. To participate in this program, nominees undertook an exam paper, signals test and also delivered upon a scenario prepared by the assessors. They then sat before the SLSCC interview panel where they were asked a series of questions. This rigorous process enabled us to determine our worthy recipients of this years Junior Lifesavers of the Year. Due to the quality of the candidates presented, the panel requested for the first time to award a High Commendation! This award was presented to Bailey Green of North Avoca SLSC. Ebony and Jayden will now be invited to attend the NSW Junior Lifesaver of the Year Camp at Colloroy in April with branch nominees from all over NSW with a view to be awarded the NSW Junior Lifesaver of the Year honour! We wish Ebony and Jayden the very best with their preparation and hope that they enjoy the experience immensely. Sincere thanks is extended to our dedicated team of assessors and the panel. Each of you provided a nurturing and encouraging environment for our nominees to excel. This program could not be possible without the contribution and support of the Junior Lifesaver of the Year Sponsor, Newcastle Permanent. We are very appreciative of your ongoing support and commitment to Surf Life Saving on the Central Coast.